After a nice morning ride on my motorcycle that worked up an appetite, I thought I'd head on over to Foo Foo Tei to see what all the rave was about. Upon arrival, I wondered in amazement how a ramen-ya could be located in this unusual industrial neighborhood and still remain successful. If it weren't for some fellow ramen lovers, I may have never known that this place existed. (Thanks Shin!) Crazy as it seems, groups of Asian people began to arrive by the car loads. The line was already 25 people long 20 minutes before opening. Could the ramen really be this good?! As the door opened I managed to survive the mad dash and make my way to front of the line--after all I was the first person to arrive. To my surprise (maybe because of the name), the waitresses all spoke Japanese and greeted us with the usual "Irrashaimase." The menu had plenty of variety, but I knew right away what I wanted. The good 'ole shoyu-ramen and gyoza. Shoyu-ramen: Okay. Let me take a deep breath. This ramen was...outstanding! The light, crisp, flavorful taste of the soup base was perfect satisfaction, even on a hot day. The noodles, slightly thinner than the norm, had a nice chewy texture that tangoed with my tongue. And for the toppings (egg, naruto, scallions, menma, moyashi, a piece of nori, and two pieces of tender fatty chashu)...they were outstanding as well. Altogether a great blend and well worth the wait. If you're corny enough, this ramen might even have you screaming foo foo for Foo Foo Tei! Gyoza: Contrary to what the picture below might show, this is not your boss' hair piece. So what is it? I'm not sure. Of all my years eating gyoza, I've never seen it cooked like this before. If you out there have any ideas, please enlighten me. Nevertheless, it tasted amazing! 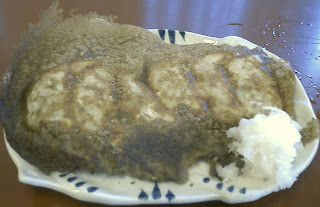 This strange crust may have hinted a slightly burnt taste, but the actual gyoza was full of juicy, garlicky minced pork. An unusual sight, but a definite recommendation. wow...that gyoza looks more like "real" chinese guo tie (potstickers). there's a place in westminster called "peking restaurant" (aka "little beijing") that serves really good ones that look like your picture. i think the "fuzz" is just flour that clumps together when you fry up the potstickers. but yeah, i've also never seen *gyoza* look like that before! @edjusted: Thanks for helping me understand this strange looking gyoza. I talked to a few people and they agree that it's flour. Some even think that it was done by mistake but I assured them that everyone's gyoza looked like this. That signifies a technique used to cook potstickers, gyoza, fried dumplings. Instead of having the gyoza boiled first and then fried, they do both at the same time. i.e. they put the raw unboiled gyoza on the pan with oil and fill the pan with water to a height of about 1/3 of the gyoza. Turn the heat on high and cover. Soon the water will boil off, the steam will cook the tops of the gyoza while it fries on the bottom, and the residue from the water (usually left seperate when boiling gyoza, noodles, or pasta separately) concentrates at the bottom and fries into that flaky crust you see. If you have a good pan, you can just flip the whole thing, crust and call, onto the plate. I do this alot when I make gyoza. From what I know, many restaurants make it like this but they just remove this crust. Hey thanks for sharing your knowledge!! No buddy, thank you for sharing your ramen picks. It helped me find a good place in my area. One more thing about the gyoza you might want to know. The reason why it was probably so good was because it was cooked fresh. Most places boil their gyoza first in large batches and fry them again later for service (which dries out the filling). In this case however, meat and all were probably raw up until they cooked it for you. Very nice, my sister took me here a few months ago and I also found it to be delicious. 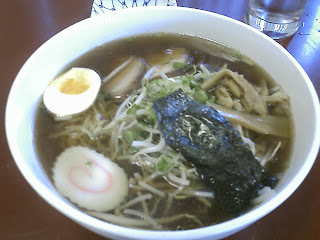 The shio broth is a bit sweet and heavy, but it's pretty satisfying. That is what they call 'gyoza with wings', or 'hane gyoza' (i think).The gyoza has been cooked with extra cornstarch water placed in the gyoza pan after steaming to add that kind of effect. It's considered to be more luxurious that way. @mattatouille: Hi Matt. Ya, the shio is good, especially in the Ebi Wantan Ramen. I actually miss not going everyday...haha. @Ken: Thanks Ken! Their gyoza is also cooked with the ramen soup instead of water to give it a better flavor. oops...did i give away the secret?